Wood pellets feature a decisive advantage: they use renewable raw materials. 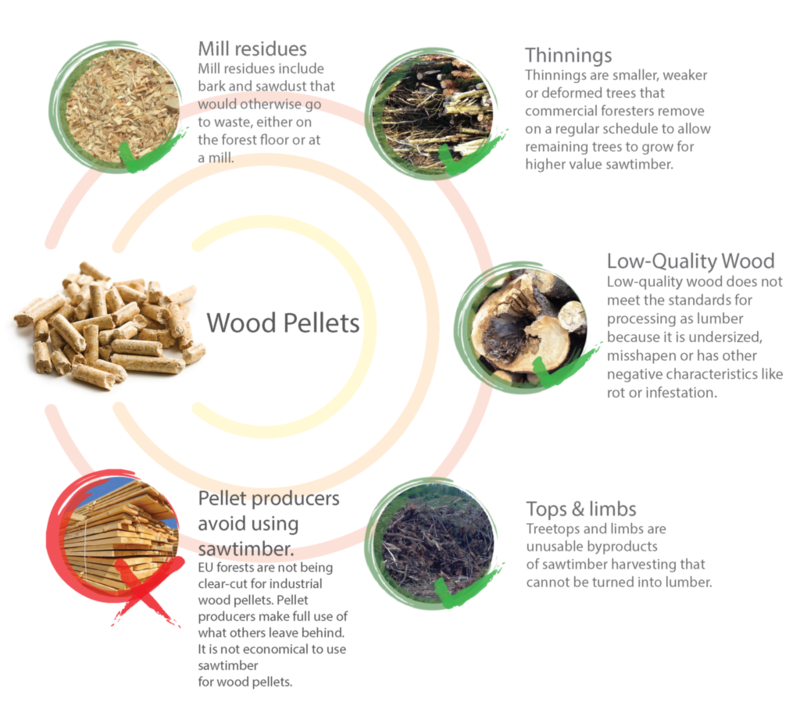 Pellets can be obtained from various types of biomass including industrial wood waste and co-products, food waste, agricultural residues, energy crops, and fruit shells. However, wood pellets are the most common type of pellet fuel and are generally made from compacted sawdust and related wood processing residues, as well as tree tops and branches discarded during logging and thinning operations. If made from roundwood, the full range of steps involving debarking, chipping, drying, and hammer milling must be done. Residues require less preparation because they are already much reduced in size and are mostly bark-free. Producers avoid using sawtimber for industrial wood pellets because it costs 6 times more than waste and pulpwood. It is simply not economical to use sawtimber for wood pellets. Regarding the resources available, Europe benefits from a long and well-established forestry culture that allow the production of wood pellets to come from sustainable and well-managed forests. Often unknown from the general public, timber stock across Europe has been increasing for the past decades, despite its use as construction timber, for paper manufacturing, and an energy source. In 1990, European forest represented a total amount of 19,7 billion m³. In 2015, EU-28 forest reached 26 billion m³, meaning that forest increased 34% over the last quarter of a century. This growth is due to two main reasons: forest areas increasing and a growth of standing volumes. As far as forest areas are concerned, according to Eurostat, EU-28 forests gained 322.800 hectares every year. To visualise this growth, European forest is increasing by the size of a football field every minute. In the meantime, carbon stock is increasing as well. Every year, forests store 362,6 million tonnes of CO2. This growth results from long lasting trends in Europe including afforestation, protection programmes developed in most EU Member States, and a decrease in agricultural area. 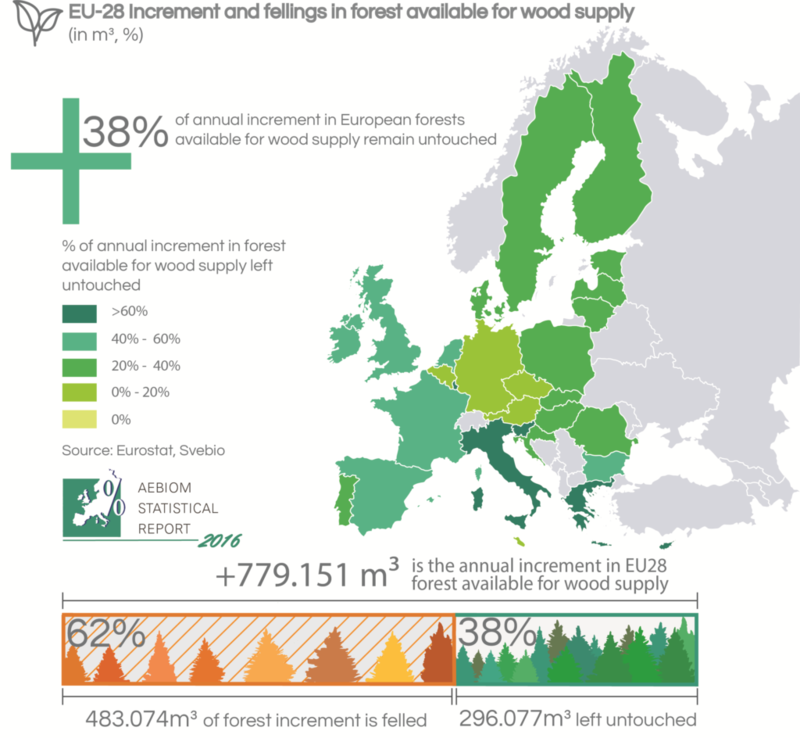 In this context, maintaining and mobilising the full potential of European forest is becoming a central challenge, showing great opportunities for bio-based economies. On average, about 62% of the annual forest increment in Europe is actually felled, meaning 38% of this annual increment remains in forests. However, the situation can vary from one country to another. Forest spreading is more common in the Mediterranean region, in countries such as Italy, France, Spain, and Slovenia, where at least 40% of the annual increment remains untouched.